It was all hands to the pump for France after fifteen minutes. Having conceded an early try when Ireland captain Rory Best touched down after just three minutes, the French were soon made aware of the fact that they were in a dog-fight at the Aviva Stadium. 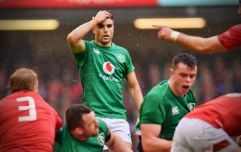 What appeared to be a quick riposte from France's full-back was ruled out for an earlier knock-on and after that, it was a case of Joe Schmidt's men inching their way forward for a second try. The inches turned into yards when Iain Henderson picked Sebastien Vahaamahina up like a toddler and drove him backwards towards his own tryline. It looked like the second try arrived moments later when some opportunism from Cian Healy gave the referee something to think about but it was eventually agreed that the Irish prop did not have enough downward pressure to warrant the score. While the five points were not awarded, perhaps the biggest shame was that it made James Ryan's monster his on Antoine Dupont irrelevant. With France scrambling to escape from behind their own tryline, Ryan was taking no prisoners and acted as something of a brick wall for Dupont, whose forward momentum was halted in no uncertain terms. The second try of the opening half finally arrived on the half-hour mark courtesy of Johnny Sexton, who wrapped around Garry Ringrose to finish under the posts and give himself no problems from the subsequent conversion. The third try of a dominant first half arrived when Jack Conan scored his sixth try for his country to make it 19-0 going into the break.